There are never-ending options when it comes to mixers. This is a good thing, as a little squirt of this or a dash of that can change the entire complexion of an alcoholic beverage. Usually however, those mixers don’t come in foam form. Enter FOMZ, a new foamy alternative to traditional mixers. The innovative edible contains no alcohol on its own, so it can also be used for virgin beverages. Using nitrous oxide as a propellant, the foamy goodness comes out of the can similar to how a whipped cream canister operates. Just point and squeeze. Press release and in-action video after the jump. TEMPE, Ariz.–(BUSINESS WIRE)–Partners in the foodservice industry Sun Orchard and Chef Richard Keys launched a new product called FOMZ today at the Nightclub & Bar Convention and Tradeshow in Las Vegas. FOMZ is a one-of-a-kind, fruit-infused food and beverage foam. Made with fresh fruit and pure cane sugar, FOMZ is low-fat, plus dairy- and alcohol-free. The unique product adds a blast of tangy flavor to a variety of food and beverages and has only four calories per serving. 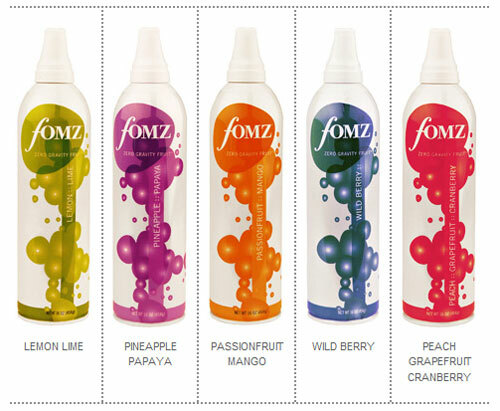 FOMZ comes in five signature flavors: lemon lime, pineapple papaya, passion fruit mango, wild berry and peach grapefruit cranberry. Sun Orchard partnered with Chef Richard Keys to create the independent company, FOMZ, the world’s sole provider of this innovative product. Chef Keys and company dreamed up the frothy fruit foam as an application for their clients in fast-casual restaurants, bars and nightclubs, and fine dining establishments alike. For more information on FOMZ, visit www.fomz.com. After more than 25 years, Sun Orchard continues to excel as a full-service processor and nationwide distributor of gently pasteurized juices, nutritious beverages, bar mixers, and other fruit-based culinary applications. Sun Orchard is “America’s Independent Micro-juicery,” taking pride in developing customized beverage solutions for foodservice and retail customers under private label as well as the Sun Orchard brand name. With production facilities in Arizona and Florida, the company is known for its continuous pursuit of quality and taste, superior foodservice science expertise, and personalized customer service. Visit www.SunOrchard.com.